A Roman sentry first stood watch on this strategic site above the Inn river valley over 2,000 years ago. Only a tower existed then. Using smoke signals to spread important news through the empire, from tower to tower, the site served as a vital communications link for the ancient world. The Romans named the site “Masciacum”; the name Schloss Matzen was taken from this word. The present structure dates back to 1167, and the first family of record were the Freundsbergs. Over the years, they fortified the castle with a second tower and extensive walls. During the 15th century, the wealthy Turndl family bought the property and turned the castle into a stunning home. Parapets were transformed into cloistered arcades, and glass—an unheard of luxury—was set into the enlarged windows. Then a succession of families, most of whom were involved with the silver and copper mines in the valley, took over the castle. Life was prosperous until the Napoleonic Wars, when the ancient Roman tower of Schloss Matzen supported field guns in defense of the town. A peasant army led by Andreas Hofer stood up to Napoleon’s army. Though Napoleon won the battle and Hofer was killed, he was highly regarded for leading the revolt. The war devastated this area of the Tyrol, and with no money for upkeep, the last owners moved out of the castle and into the stables. In 1873 Fanny Read Grohman, an Irishwoman, bought the property and restored it. Her son William Baillie-Grohman continued her work, wrote a number of books about the history of the valley, and once even hosted Theodore Roosevelt on a hunt. The family maintained the castle through two World Wars, returning to Britain when the fighting got too close. The fourth generation of the family sold the castle in 1957 to the American architect Ernest Kump, who was of Austrian background. Kump carefully installed modern bathrooms, plumbing, and central heating while preserving the integrity of the castle’s medieval architecture. In 2008, Matzen’s new owners acquired the property and after extensive renovation reopened it as a beautiful castle hotel. The attention to historical detail and preservation of its architectural integrity makes Schloss Matzen one of my favorite castle hotels. It is only ten minutes from excellent skiing, a half-day from Vienna, and conveniently close to Italy, Switzerland, and Germany—making the castle a convenient stopover spot. Apart from the restaurant next to the castle, you’re out of walking distance from other eating options. Reith is located about 30 minutes east of Innsbruck. Take the autobahn toward Salzburg. Exit at Kramsach/Rattenberg/Brixlegg. Trains run from Innsbruck to Jenbach, and from Salzburg or Munich to Worgl; taxis from the station to the castle take about 10 minutes. To best enjoy the area you’ll need a car. 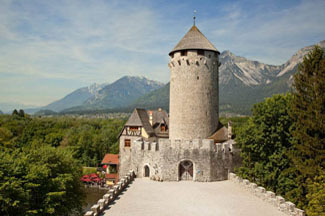 Situated high in the Austrian Alps, this cozy castle hotel is surrounded by 2,500 acres of parkland. The castle’s interior reveals the medieval architectural charm of Gothic cloisters, carved marble doorways, high beamed ceilings, and intricately decorated wrought iron hinges and locks. Most of the stately guest rooms in this five-floor castle have high ceilings and thick stone walls. Each room has retained its historical ambience, accented by carefully chosen antiques, but each is still equipped with a flat-screen, satellite TV and wi-fi. It’s absolutely impossible to pick out a favorite. Rooms can feature heavy wood-beamed ceilings; beds with an emblazoned coat-of-arms in the headboard; intricately carved beds, and parquet floors accented by Oriental rugs. A few of the suites have green tiled fireplaces with cozy seating areas. For an added treat, beautifully decorated bathrooms have heated floors.View’s in the larger suites look out over the valley and the Alps. Directly below the castle is a friendly and comfortable restaurant that serves regional specialties. It’s closed on Mondays and Tuesdays. Highly romantic and with loving care given to historical detail.